"A public union employee, a tea party activist, and a CEO are sitting at a table with a plate of a dozen cookies in the middle of it. The CEO takes 11 of the cookies, turns to the tea partier and says, 'Watch out for that union guy. He wants a piece of your cookie.'" It's been a hard day, a hard week, a hard couple of years. I'm finding I may have to say goodbye to a number of people with whom I've worked for years. For all I know, my own job was on the chopping block; many others at our school didn't think this would happen to them, and yet it did. We are lopping off entire programs: engineering, architecture, mass media and others. Deep cuts in others. The math is frightening; the state doesn't take in enough to pay for the education it is committed to provide. So the cuts come. We can take steps; there is talk of offering a voluntary pay cut to save jobs and programs. There are other alternatives being suggested. But all of them represent a retreat from education. I don't blame our local administrators; they've been dealt the cards they have. Many of them are new at their jobs, having been hired only in the last year or two. We will see how they deal with these hard issues. Today's cuts are the opening move and much is to be negotiated. I do blame the politicians. I think that the people of our state might be willing to sacrifice a little longer to maintain the education of their children, their spouses, their parents. But there is a group, a political party, that is resisting letting the population even vote to continue a bit longer the taxes and fees that were instituted in the last year or two and are expiring. They should get out of the way and at least let us try to convince the population that education is worth saving. And there is the bigger issue, the subject of the joke of the day. There is a yawning economic chasm between the rich and the rest of our society. More wealth is concentrated with the highest two percent of the population than at any time in the last century. And no one seems to ask, or even suggest that they could help in this time of dire need, by paying taxes at a rate equal to what they paid only a decade ago, before the Bush tax cuts and others decimated federal and state budgets. Instead we argue among ourselves over the crumbs. The economists tell us the recession is over. But all I see happening around my community is more store closings, more employees being laid off, more houses being foreclosed. We are living in a depression, and I don't see the end of it. Maybe there is some economist who can explain to me how things are better right now. A message to the ultra-rich: laid-off workers don't buy your products, invest in your hedge funds, or buy houses. Neither do people who are still working but are worried for their jobs and seeing their salaries cut. I paint with broad brush strokes and I know that there are many well-off people who understand this basic economic truth, but there are obviously many who don't. This society allowed you to become rich; to paraphrase the Bible, from those who are given much, much is expected. It's time for everyone in our society to step up to the plate and work together to get out of this horrific economic mess. Education made this country and my state great. I knew many of the "greatest generation" who came home from the second world war, got an education, and proceeded to build the greatest economy ever seen on this planet. They went to the moon and the planets, they invented computers that transformed society, they built a society that took care of the aged, the sick, and disabled. They made unbelievable advances in medicine. They built the best cars and transportation systems in the world. I saw these things happen in my lifetime. Our children have that potential, if we can only guide them and inspire them. But instead we are now in retreat; education is devalued and teachers and professors are demonized by politicians. We are made to do more, far more, with less. I despair and grieve at what our society has come to. We have huge challenges ahead as a society; the end of the oil economy, global climate change, resource depletion, water shortages, food production disruptions and many others in the earth sciences alone. Every other academic field can point to other big problems. And our response is to cut the pool of talented individuals by making education inaccessible to more and more members of our society. 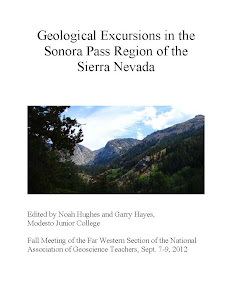 Students of the geological sciences are invited and encouraged to attend Far Western Section events at greatly reduced rates. See the conference website for details. Hope to see you there! There was supposed to be a snowstorm in San Francisco last night, the first in a very long time, and snow levels in our valley were supposed to reach as low as 100 feet or so, so we set out to see if any had fallen in the Sierra Nevada foothills above our home. 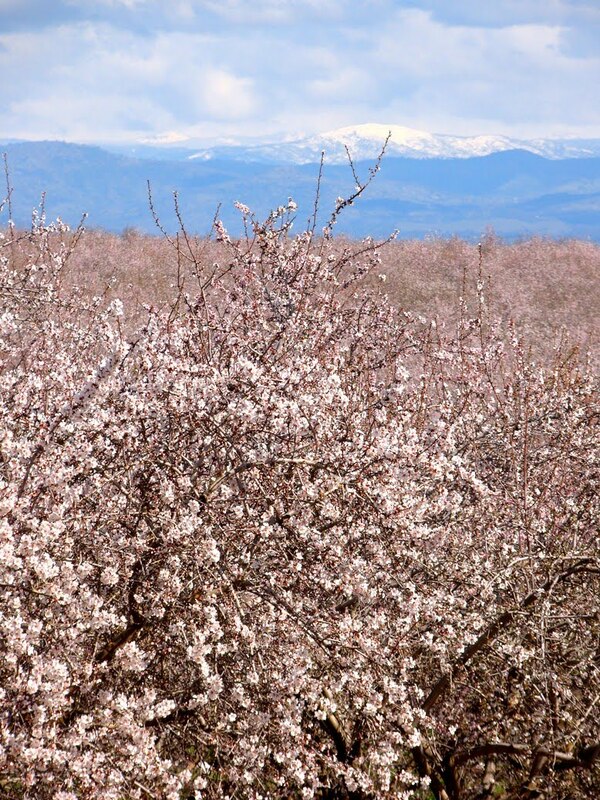 If there was any, it melted early, but we found a different kind of snow on the almond orchards that cover the low hills: blossoms! I can't help but think that the blossoms are blooming earlier every year, but it always happens, and my hay fever follows soon thereafter. Still, it is a beautiful sight to see thousands of acres of flowers and deliriously happy bees. 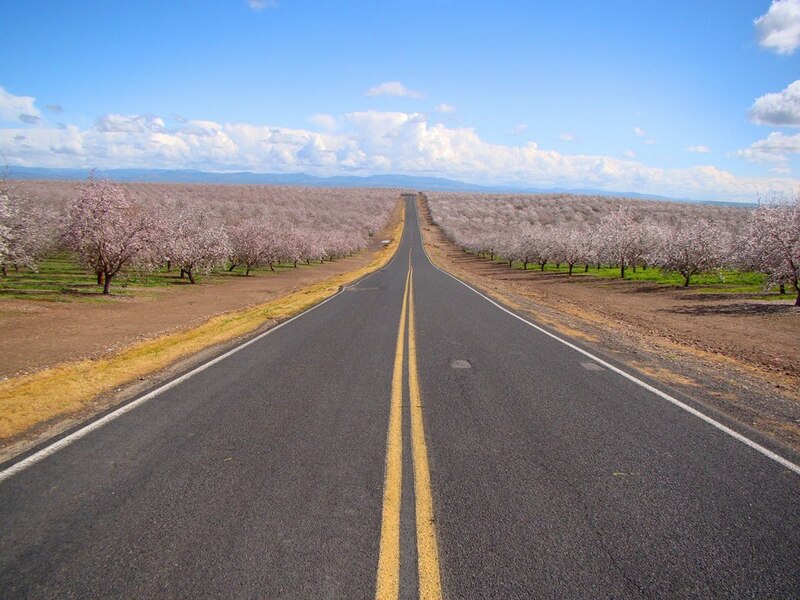 California's Central Valley (we call it the Great Valley) is one of the most productive agricultural regions in the world, but it rarely offers much to look at in a scenery sense, or in a geological sense for that matter. 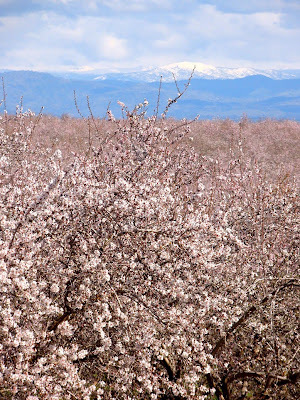 But for a few weeks in the spring, it's a happening place, and is well worth a visit. 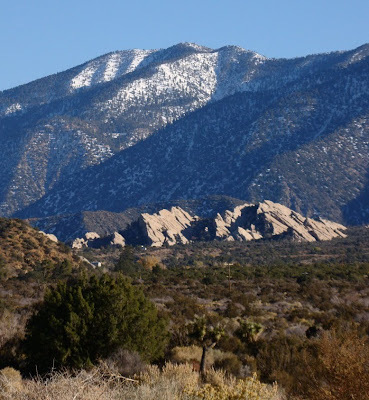 Have you ever wanted to know more about the geology of southern California, the San Andreas fault, and some of the incredibly strange rocks that crop out around the San Gabriel Mountains, like Vasquez Rocks or Devil's Punchbowl? 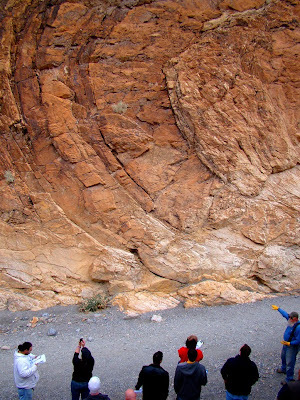 The Far Western Section of the National Association of Geoscience Teachers invites you to join us on March 25-27, 2011 for our spring meeting, hosted by the Caltech Tectonics Observatory in Pasadena, California. These meetings are a great way to learn some fascinating geology, meet some fascinating people, and as much as I would like to say "have a scholarly time", I'm going to instead say "have a fun time". Complete details of the meeting can be found on the Caltech Tectonics Observatory website at http://www.tectonics.caltech.edu/meetings/nagt/. You do not need to be a member of NAGT to attend (but we will gladly welcome you into membership if you wish to! ), and the cost of the event is modest (less than $100 if you register before Feb. 25, plus a bit more for the Saturday banquet). Check out the wonderful slate of activities and field trips below! The registration form is here: http://www.tectonics.caltech.edu/meetings/nagt/register.pdf. Join us! 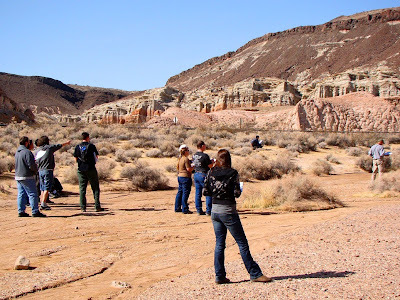 Learn more about the activities and opportunities at the Far Western Section! Check out our website, the Far Western Section of the National Association of Geoscience Teachers here, the FWS blog here, and our Facebook page here. 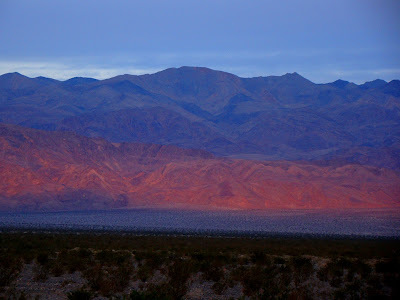 Day dawns on the Cottonwood Mountains west of Stovepipe Wells. We've got about 400 miles to reach home, but we weren't going to let that stop us from doing a few last minute stops at Death Valley National Park. We've spent three days exploring the region (here, here and here), successfully avoiding the worst of California's storms this last weekend, and seeing some wonderful geology. 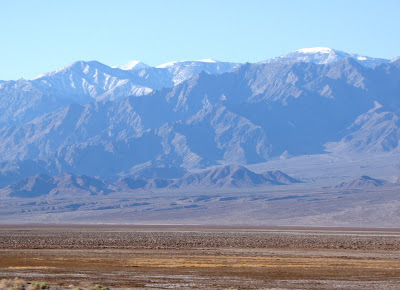 Tucki Mountain is an immense edifice rising 8,000 above our camp at Stovepipe Wells at sea level. The shape of the mountain is reminiscent of a turtleback fault, and it may in fact be an incompletely exposed metamorphic core complex (I would love to hear from the structural geologists about it). 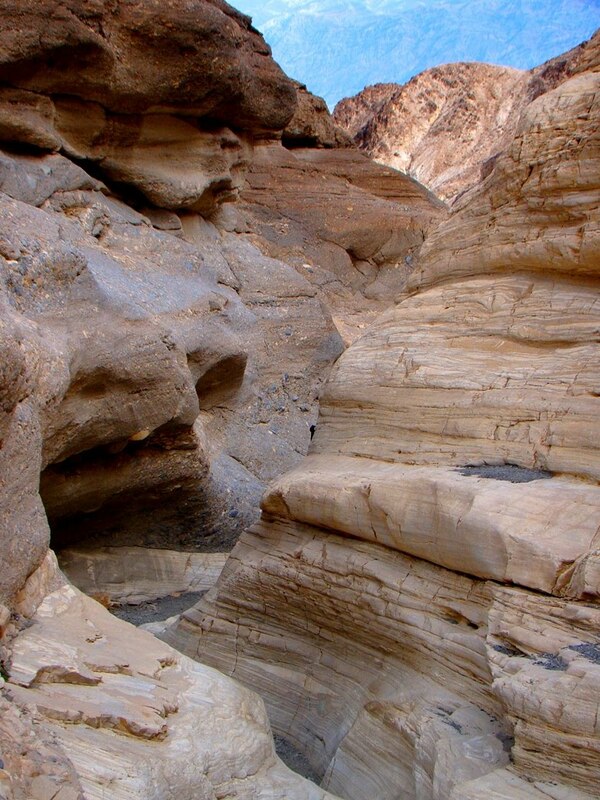 Mosaic Canyon is a deep gorge on the north flank that narrows down to a twisting labyrinth in its lower reaches. It is a main tourist stop, but most visitors never notice the spectacularly exposed structural features. Just a short distance up the canyon from the parking lot is one of the best exposed examples of a normal fault I can imagine. Laura is resting her back on the headwall and sitting, more or less, on the footwall. The different colored layers show that the headwall dropped relative to the footwall, indicating extensional stress. A little further up the canyon, the so-called 'mosaics' appear, chunks and pieces of canyon alluvium that were lithified, glued to the canyon walls, and exposed by continued downward erosion of the canyon. The photo above would serve as a perfect example of the appearance of an angular unconformity (a buried erosion surface with tilted rocks beneath and horizontal layers above), although the specific relationships here stretch the definition a little bit. Paul was describing a large recumbent fold in the upper part of the narrows. 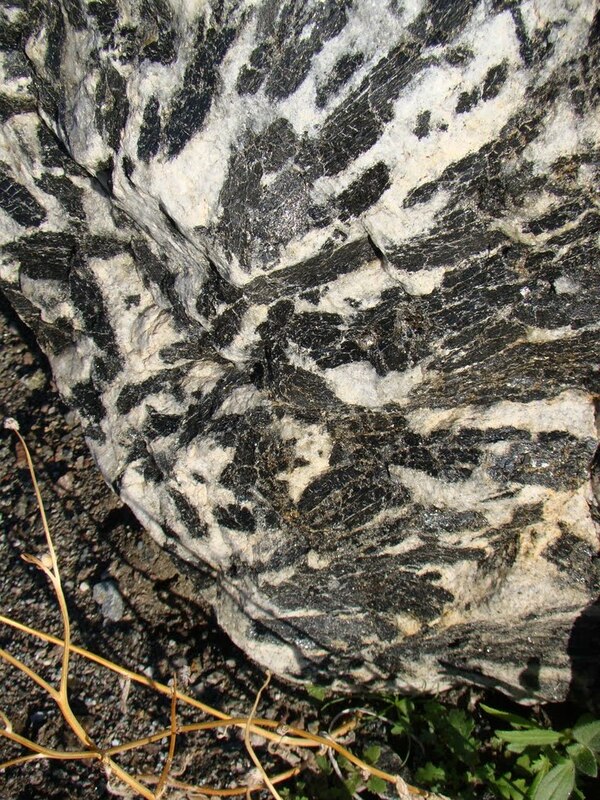 These rocks have undergone an astounding amount of deformation, having been twisted into tight folds multiple times. 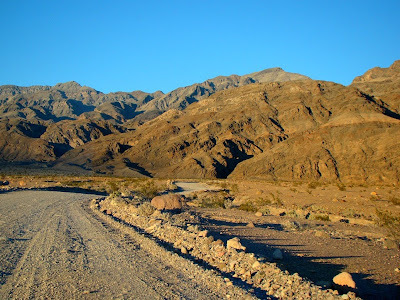 We made our way down the canyon for one last restroom break and chance for curios and t-shirts, and starting winding our way up into the Panamint Mountains for a last look at the valley. 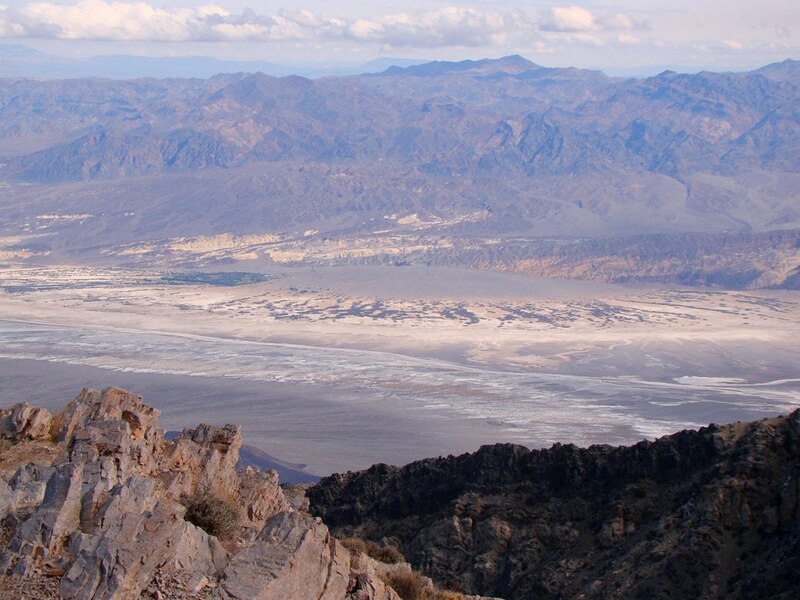 The road down the Mosaic Canyon fan provided a marvelous view of the Death Valley Dunes (Mesquite Dunes). 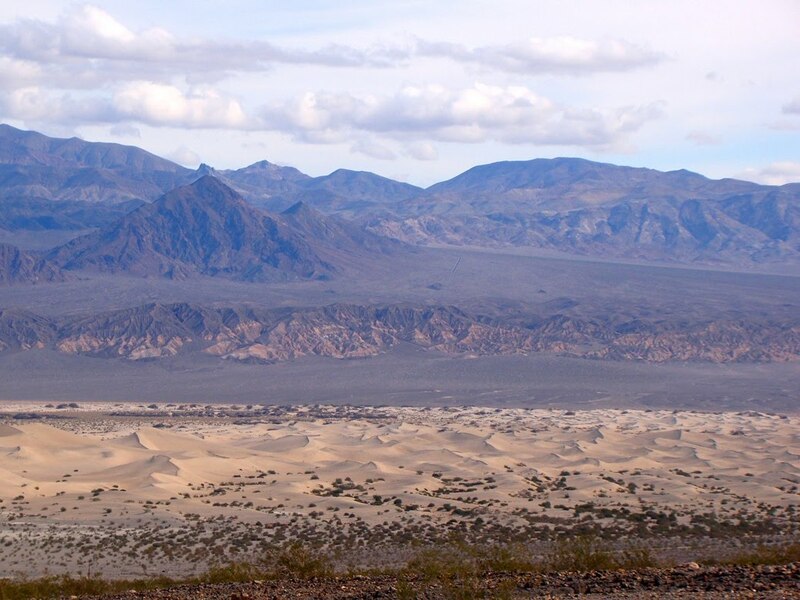 Contrary to many people's stereotypes about deserts, dunes are a relatively rare part of the landscape in a place like Death Valley. Powerful winds blow the sands off the alluvial fans and down the long valleys until some flank of a mountain range interrupts the flow of the wind. The sand is deposited and shifts back and forth in the wind eddies. The highest of the dunes reach 150 feet or so. They are especially fascinating at night and in the twilight hours. In the morning the surfaces are covered by trackways of insects and animals. 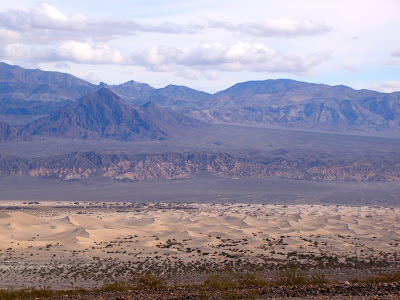 Most people don't realize they have seen the dunes; they were a stand-in for the Star Wars planet of Tantooine (the Dante's View panorama of Death Valley was used for the setting of Mos Eisley). 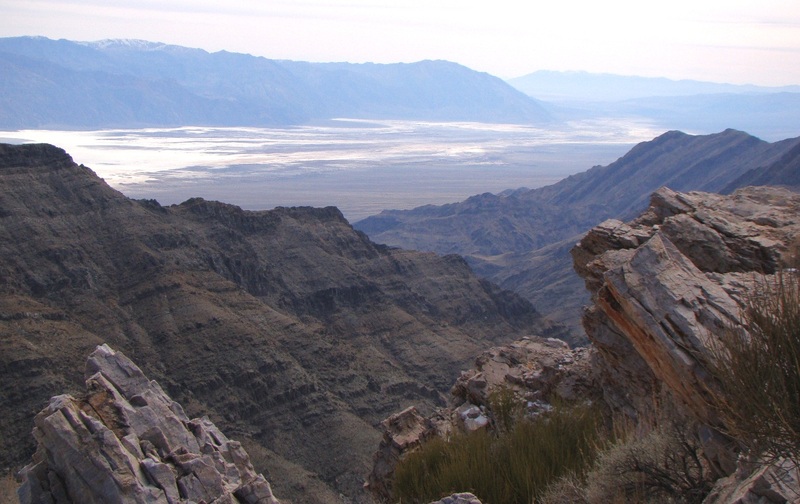 The interruption of the fan in the far distance is the trace of the Furnace Creek fault, a strike-slip fault that follows the base of the Funeral Mountains on the skyline. Death Valley hasn't been historically active as far as earthquakes go, but there are many signs that the faults are quite active. We drove up the gravel road to Aguereberry Point. 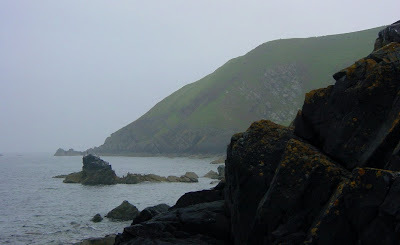 The gentle rolling landscape gave little indication of the jagged cliffs just over the ridgetop. 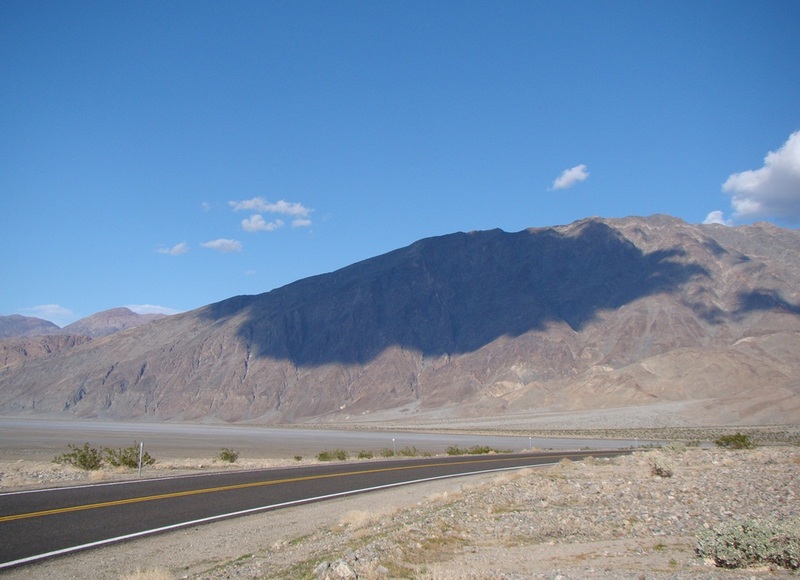 These hills give some indication of the topography of the region prior to the formation of the deep fault grabens of Death Valley and Panamint Valley. They were preserved as the mountains rose and valley collapsed, but in the fullness of geologic time, the hills will be breached by headward erosion and will disappear. We topped the ridge at 6,000 feet and arrived at Aguereberry Point. 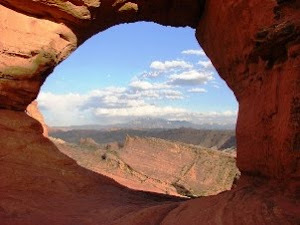 Being at the end of a gravel road, it receives far fewer visitors than Dante's View, but it is no less spectacular. 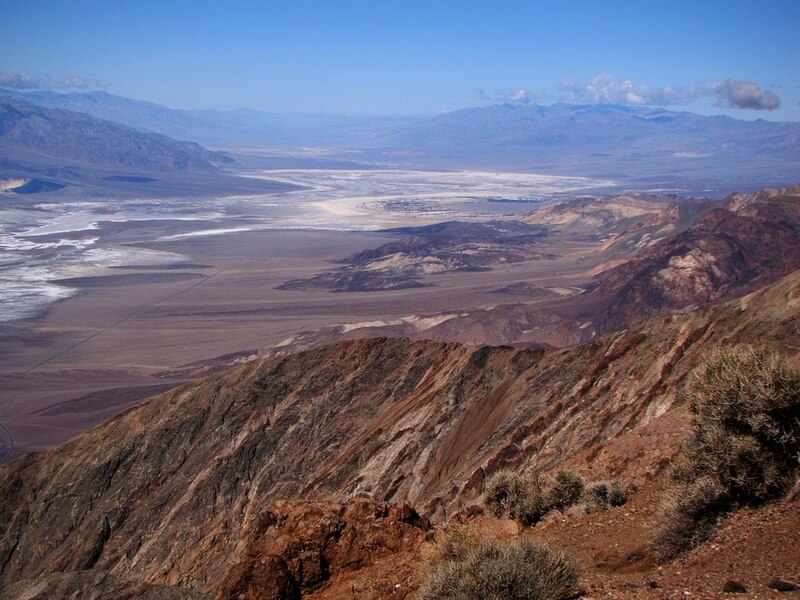 One stands beneath the flank of 11,049 foot Telescope Peak, and has a sweeping 270 degree view of Death Valley, the Panamint Mountains, the Inyo Mountains, and the Sierra Nevada in the far distance. 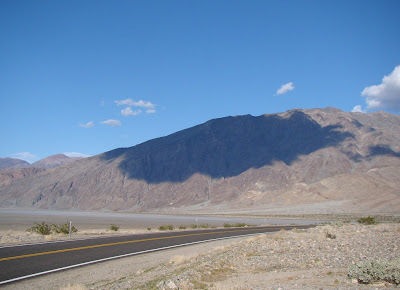 At our feet was the massive alluvial fan of Furnace Creek, the location of many of the park's tourist facilities. 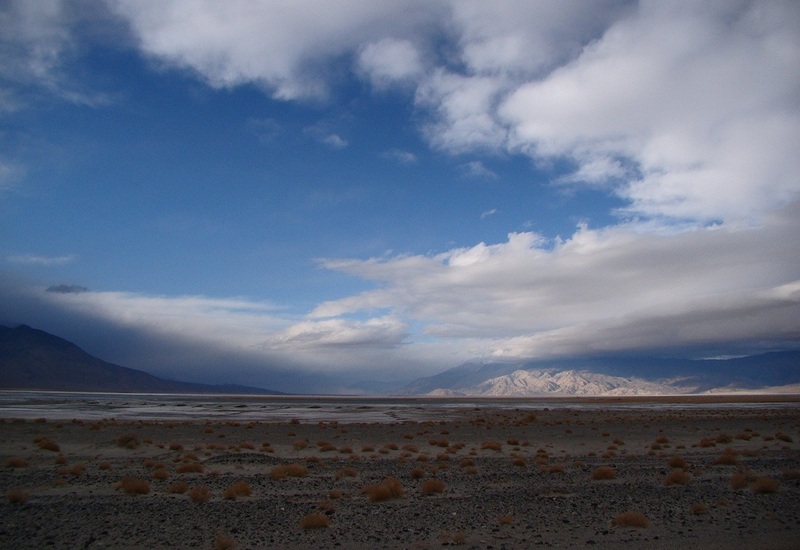 The salt flats of Badwater and the Black Mountains fill the view to the southeast. 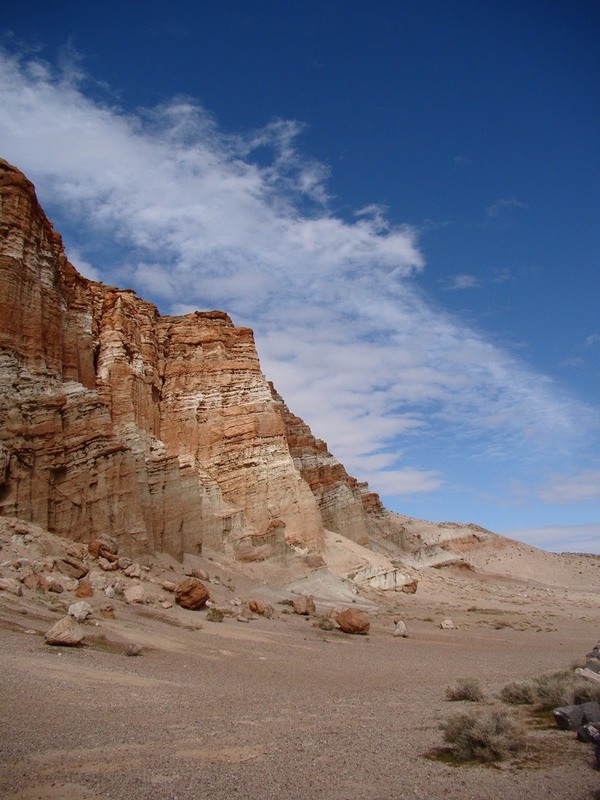 In the foreground are tilted Paleozoic sediments, carbonates and sandstones that were deposited in shallow seas, but ultimately accumulated to depths of many thousands of feet. We were standing on quartzite that was once a beach in Cambrian time 500 million years ago. We could see the burrows made by countless worms in the tropical climate. Finally the last geology stop was complete, and we hit the long road home, via Trona, Ridgecrest, Bakersfield and Fresno. It was a good trip! I hope you've enjoyed the virtual tour. 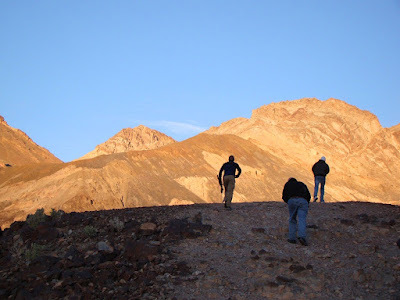 Death Valley Days: The Third Day - This place is wild! Trivia of the night: In what movie have we seen this view before? It was just one of the incredible sights on our third day through Death Valley National Park. The sun didn't just break through...it appeared in all its glory as the last vestiges of our storm blew east. Only a few drops fell during the night. 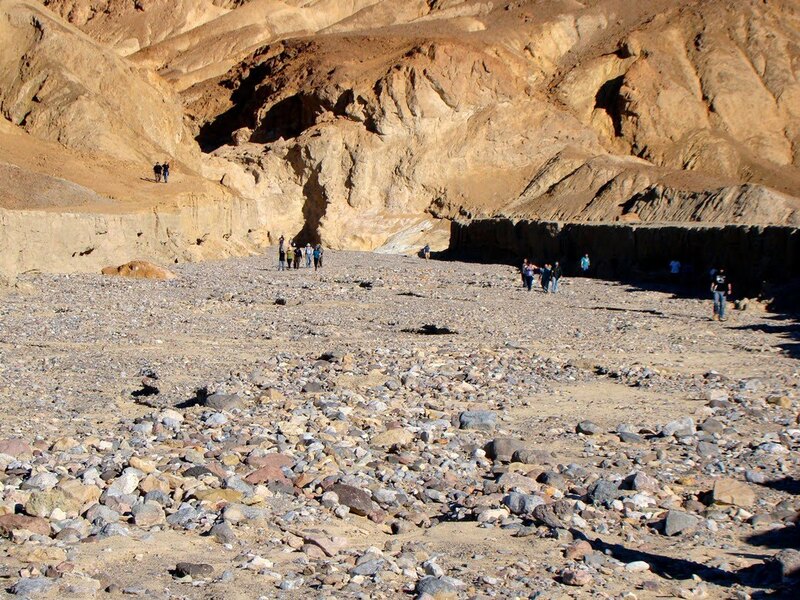 Other questions of trivia: What is the last thing one expects to find in the bottom of Death Valley, the hottest and driest place in the northern hemisphere? How about a permanent stream? And yet there is one, Salt Creek, which is caused by a structural tweak of the valley floor by faulting. The consequence is that groundwater is forced to the surface and flows for a distance of a mile or so before sinking into the ground again. This is a 'river' flowing below sea level! The only thing that could make this stream stranger is to imagine it filled with fish. It is. How in the world did they get there? In a word, they got here more or less by accident during the Ice Ages, when giant pluvial lakes (glacial meltwater lakes) filled the low basins of the Basin and Range Province. 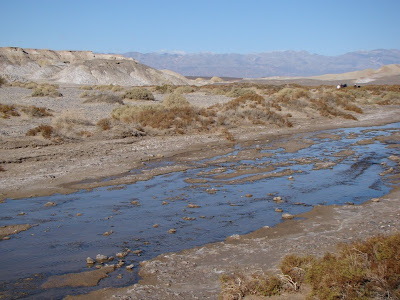 At some point a water connection was made with the Colorado River system, and fish moved into the freshwater lakes of Death Valley and other basins. When the ice ages ended 12,000 years ago, the lakes dried up, but isolated springs and waterways provided a refuge for a few lucky survivors. Since some of the water sources were salty and others fresh water, the fish diverged from a single species into at least five, with a total of 10 distinct populations. The Salt Creek Pupfish survive in the hottest environment of any fish on the planet, often as much as 100 degrees. After visiting with the fish, we headed a mile high in the Black Mountains for a spectacular view of the valley at Dante's View. 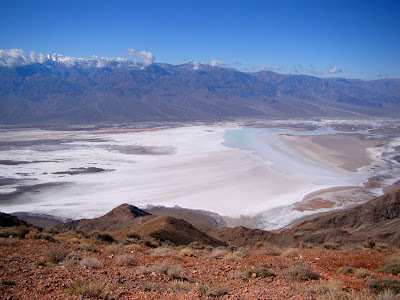 That's one part of the view in the picture at the top of the post, and the salt flats at Badwater are shown below. The faint turquoise color on the right is water on the playa surface, left over from December and January's storms. After taking in the view and talking about the alluvial fans at the base of the mountain, we headed down to Zabriskie Point to work on a project, trying to assess the problems with diverting a dangerous desert wash into the badlands topograpy below Manly Beacon. The students made their predictions not knowing that the diversion was already made 70 years ago. Their conclusions were pretty good, especially about the rapid downcutting in the soft shales and mudstones, and it was neat that they could immediately see the consequences of the diversion. 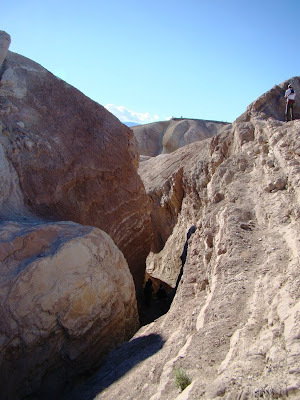 Gower Gulch (below), the diversion point, has carved downwards about 60 feet in as many years. It has an intricate set of meanders and loops, and it changes visibly from year to year. The lower fan of Gower Gulch has changed too, with the higher velocity floods carving a deep channel in the fan surface(below). Our day was almost done with, but we had one more goal: Walking right into the heart of a mountain range, at Titus Canyon. Titus is a huge gorge, in places more than three thousand feet deep, and in the lower canyon the walls so narrow that passenger cars can barely pass through. Getting there required a bumpy three mile ride up the bouldery alluvial fan, and then we entered on foot. 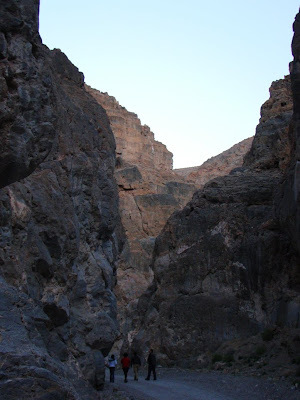 In the twilight the canyon was peaceful and quiet, and the gray cliffs towered above us. It was a good way to end the day's journeys. It's a starry night and we have to go home tomorrow, so I am off to sleep. We have a few more stops in the morning, so look for at least one more entry of Death Valley Days! Adios! The biggest, baddest storms still find heartbreak in the barren jagged peaks of the Basin and Range Province, and especially Death Valley. 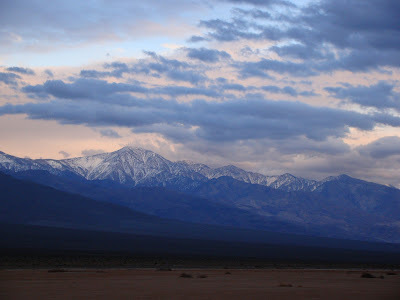 Last night we awaited the onslaught of winds and a 100% chance of rain, but the mountain barriers of the Panamint and Cottonwood Mountains absorbed most of the storm's moisture, and we had just a spritz of rain in our camp at Stovepipe. Furnace Creek got a bit more, 0.14 inches, but all in all we dodged a very big bullet, aside from some inconveniently heavy winds that destroyed one of the student's tents overnight. 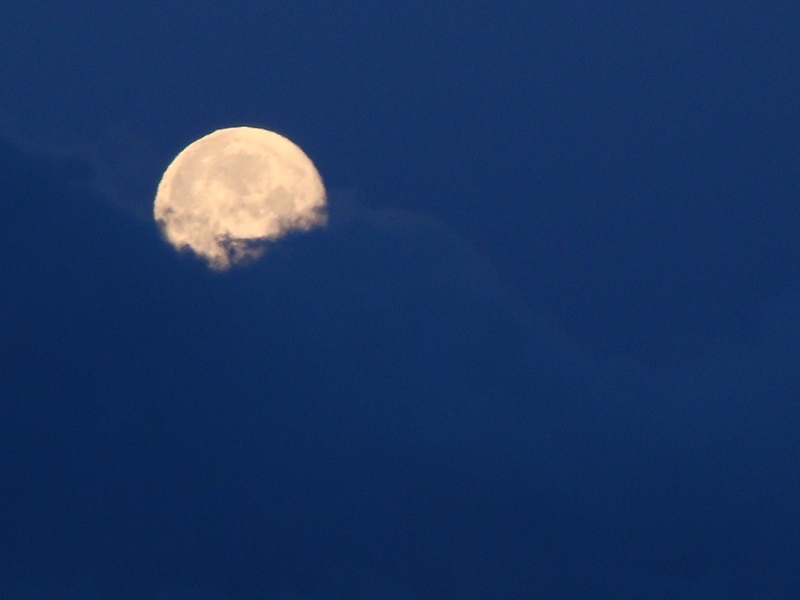 Morning arrived with a wonderful moonset over the Cottonwoods. 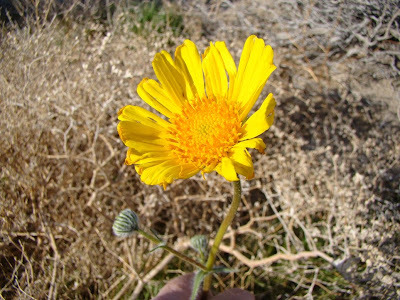 It would be inaccurate to say that the flower blooms have started in earnest, but we found a few here and there, and they added a nice splash of color to the desert. 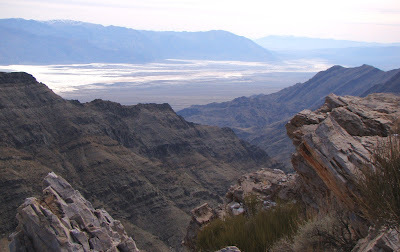 We made stops at some fault exposures east of the park near Shoshone (the 'Charlie Brown outcrop'), and headed over the Black Mountains into the southern reaches of the Death Valley graben. 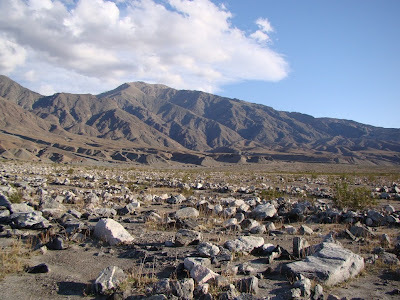 We checked out the Amargosa Chaos exposures at Exclamation Point, the Pahrump Group near Ashford Mills, the fault scarps, offset cinder cone and wave cut terraces near Shoreline Butte, and I took...no pictures! I was busy...eh...teaching and stuff. 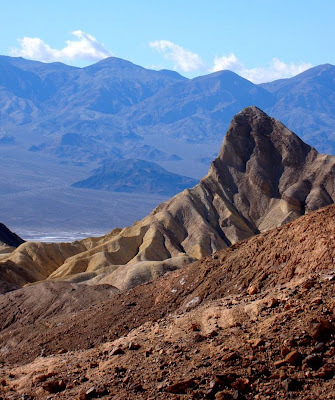 We made a stop at Mormon Point and took in a couple of Death Valley's enigmatic features, the turtleback faults. These are massive dome-shaped fault surfaces whose origins are debated, but they are composed of deep crustal rocks that have been metamorphosed into gneiss and schist. 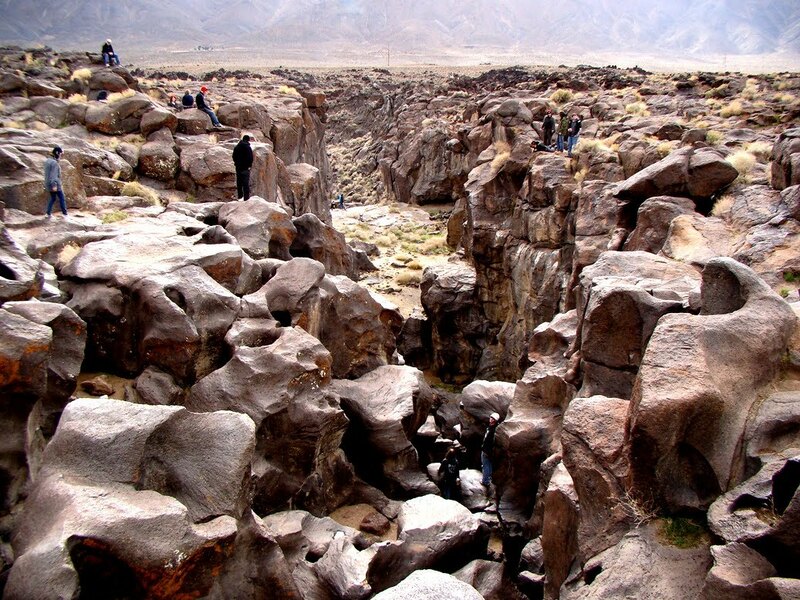 The rugged exposures reveal collisions of land masses around 1.7 billion years ago, and are the oldest rocks in the park. Mudflows and flashfloods have scattered large boulders of the ancient rock across the valley floor and are a treat to explore. 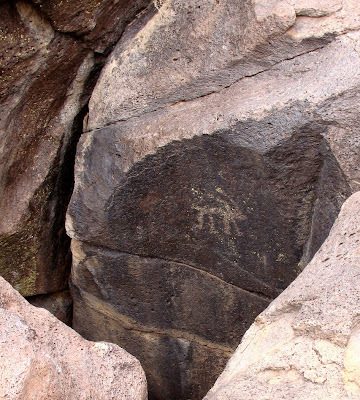 One huge boulder (below) contained huge crystals of black hornblende 3-4 inches long. We of course had to do the touristy thing and visited the lowest point in the western hemisphere at Badwater. 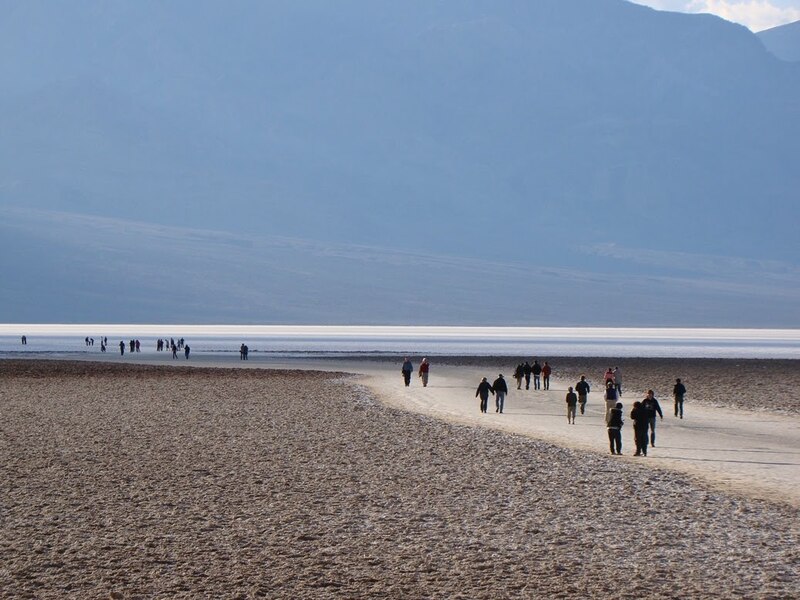 The actual lowest point is out on the salt flats a mile or two away, but what's a foot or two between friends? 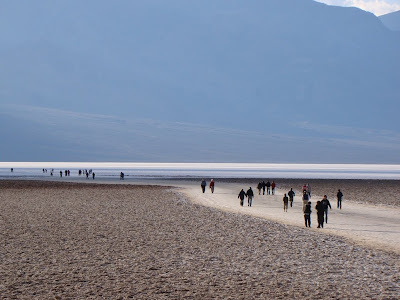 People were walking out onto the freshest salt exposures. It's also a touristy thing too, but we wanted to see the flaming colors of the sunset on the Artists Palette. We drove up Artist Drive as fast as we were able, and we didn't quite get to the Palette, but we did stop and get a nice panorama of the other volcanic rocks at the north end of the Black Mountains. Conditions are a lot calmer tonight, so hopefully no rain or heavy winds. Two nights of that and I'll have a tired class, and we have lots of great stuff to do tomorrow! We actually left last night, but drove the length of the Central Valley in the dark to make today more interesting (trust me, it's better that way). We drove through an intense rainstorm, raced on ahead of it, and set up camp near Bakersfield, hunkering down to await the onslaught. It didn't come! It's not that there is no storm, it's huge. But it was tracking north, and not moving east, so we were dry all night, and had sun for most of the day. First stop was in Neogene marine sediments at the south end of the Great Valley, which included an introduction to field geology and the idea of formations and environments of deposition (our students are mostly seeing geology in the field for the first time). How do you know a layer is marine? One clue is in the hand of the student above: fossils! Somehow, unsurprisingly, a place called Sharktooth Hill yielded up shark teeth (and a few fragments of seagoing mammals). The second stop was one of California's wonderful state parks (threatened in the current budget mess): Red Rock Canyon State Park. The Neogene sediments here, 60 miles farther inland, are terrestrial in nature, suggesting that the shoreline of the Pacific Ocean was a lot farther east a few million years ago. The students worked at the idea dividing an outcrop into formations or members. 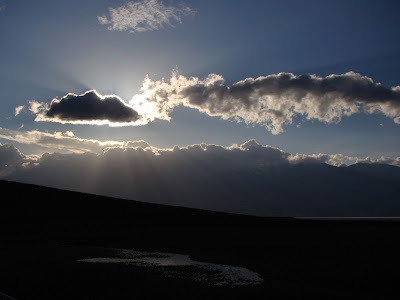 The sun was shining, but we were beginning to realize that we were being stalked and pursued by ominous looking clouds on the horizon. So, like refugees in a disaster movie, we set off in the direction that seemed the least stormy: north. In about 45 minutes we reached Fossil Falls. It isn't a place to find fossils, it's a place to search for Ice Age rivers that haven't existed for 12,000 years or more. The overflow from Pleistocene Owens Lake poured over the lip of a basalt cliff and formed a bizarre landscape of giant potholes and polished basalt. 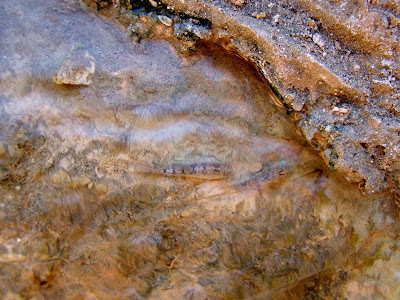 There was an ancient form of life present, but it was still living: fairy shrimp, surviving in a few drying pools at the bottom of some of the potholes. The storm was intensifying to the north of us and from behind, and from the west. We turned east (which we were going to do anyway), and skirted the south end of Owens Lake. 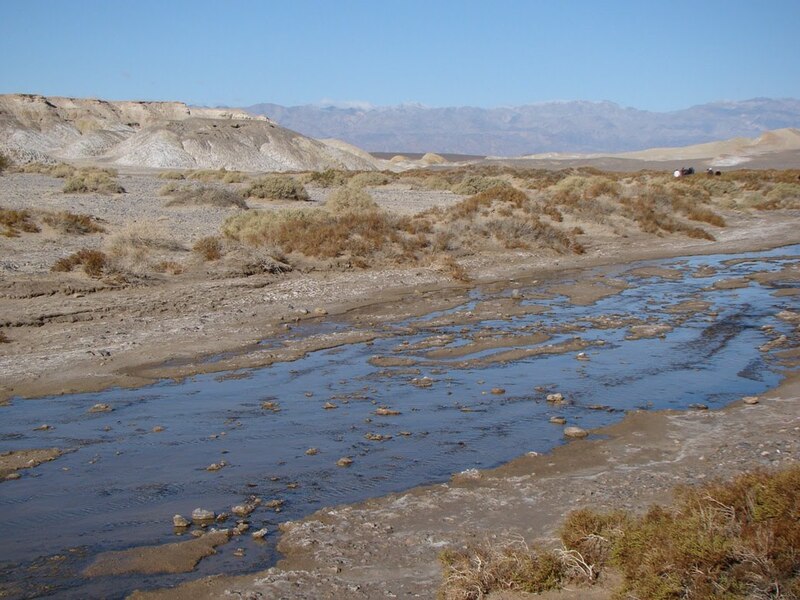 In the Ice Ages, it was hundreds of feet deep, and in modern times a lake 30 feet deep persisted with no outlet, but Los Angeles sealed the fate of the lake in the 1920s when they diverted the streams feeding into the Owens River and sent the water south. 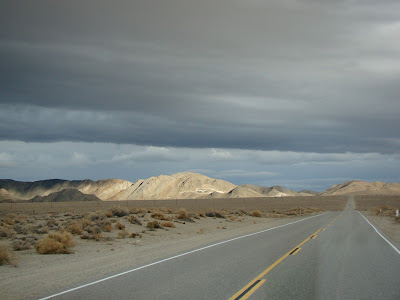 The weather turned ever more ominous as we passed over the Inyo Mountains near old mining town of Darwin, but a thin beam of sunlight broke through the clouds and lit up a ridge of Paleozoic limestone along the crest of the mountains. 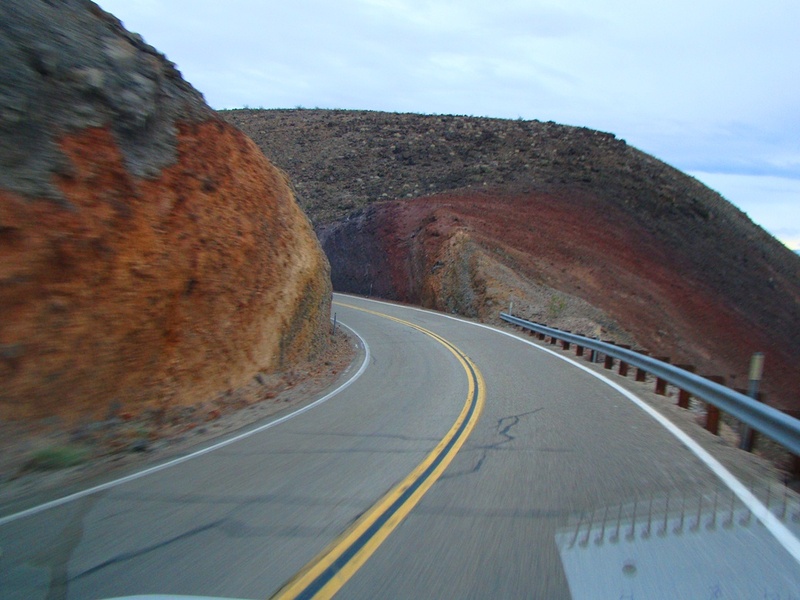 We careened down the Inyos into the Panamint Valley, driving right through the heart of a breached cinder cone in the process. 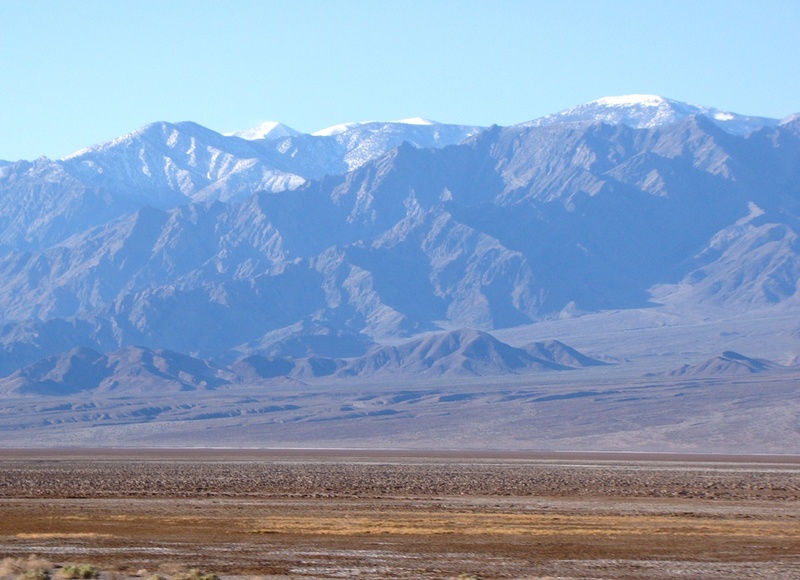 After being buzzed by an F-16 at only a few hundred feet, we crossed the bottom of Panamint Valley, and were treated with a marvelous view of Telescope Peak, which at 11,049 feet is the highest elevation in Death Valley National Park. 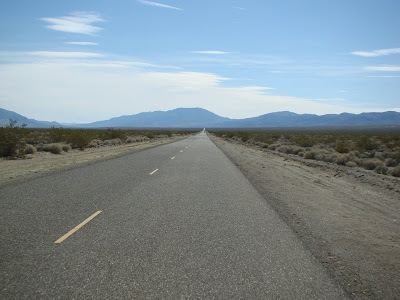 We crossed Towne Pass in the Panamint Mountains (5,000 feet), and descended a vertical mile to our camp at Stovepipe Wells, elevation...0 feet. After spending an entire day worrying about the gigantic storm enveloping California, we had not had a single drop of rain. Looking at the weather radar, I don't think we will be so lucky tonight; a 100%chance of rain is in the forecast. We battened down the hatches, and snuggled in for a good night's sleep. Tomorrow the adventure continues! What in the world could cause students to be taking pictures of murky brown water?? I am leaving tomorrow on our yearly field studies journey to Death Valley National Park. It is one of the centerpieces of our earth science/geology program at our community college, and has been a yearly tradition since I started at the school in 1988. 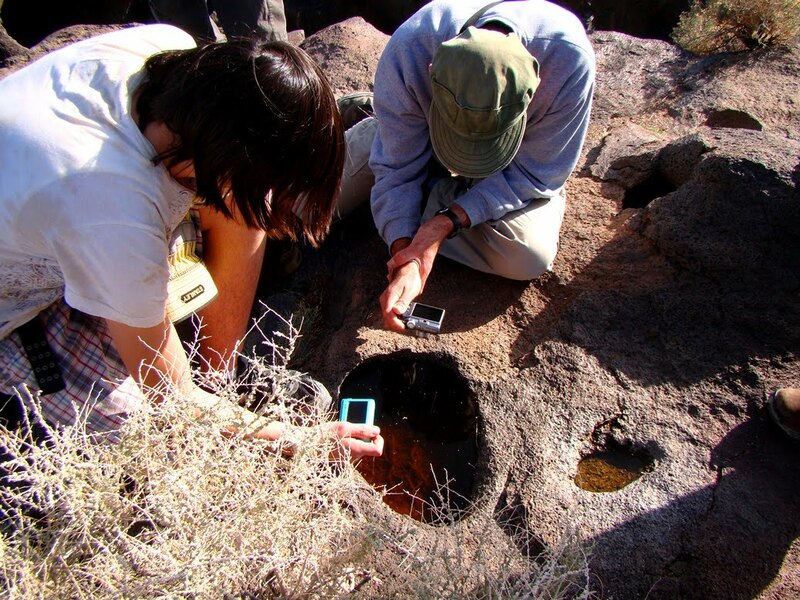 Hundreds of students have attended and participated; many have gone on to become geology majors and teachers, and many point to their experience in the field as the defining point in their lives. 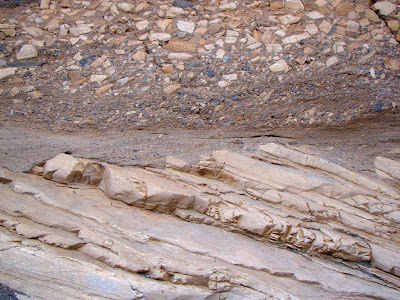 Geology is the most field oriented of the natural sciences. One could be educated about the facts of the earth in a classroom, one can look at all the latest innovative media resources about the earth, and one can become proficient at the science. But classroom learning is nothing like standing on the outcrop, and seeing the rocks, seeing the actual structure of the earth. To be a student standing in front of an angular unconformity or a fault line in an outcrop, with all the vegetation and debris obscuring the actual relationships, is to be a James Hutton, a Charles Lyell, or a Nicolas Steno on the threshold of significant insight. It is the exhilaration of discovery, a deeper understanding growing out of putting the pieces together by yourself. It is the exploration of mysterious places, a voyage into terra incognita. I don't think I can overstate the value of field experiences in an earth science/geology education. But I don't know what is coming next. The depression (and despite what the economists say, this is a depression) is ripping out the heart of education in our state and across the country. In the midst of economic chaos, the need for an educated population is the greatest it has ever been, and our resources are shrinking. Where do we go from here? For now, I'm going to do what I can, and what is possible. I'm going to take an enthusiastic group of students into the wilds, and we will experience together the thrill of discovery. And I'm going to hope for the future. What geological concept or idea did you hear about that you had no notion of before (and likely surprised you in some way)? Part of my wedge entry comes from an earlier blog post (self-plagiarism? 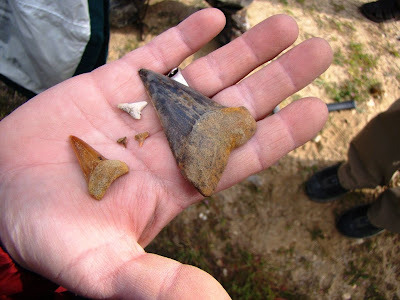 ), but I was actually talking about something else at the time, the discovery of my first fossil. "It took only a split second to take me back forty years to the North Rim of the Grand Canyon, where a 10 year old boy was on his first trip to the beautiful national park. But I had found out something strange at the small visitor center there. 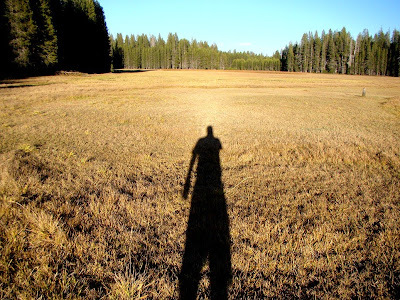 The ground I was walking on at more than 8,000 feet had once been on the bottom of the sea! Say what? How could that be? I was already at an age where I had figured out that Noah's Flood couldn't account for this. Where was all the water that it could even cover Mt. Everest and all the other mountains of the world? It was clear that something had happened, but I wasn't quite in a place where I could understand the idea of vast uplift across an entire region. I spent days musing about this, enough that the memory is clear after all these years." It was years before I revisited the problem of marine rocks at the tops of mountains and high plateaus (I had all those teen years to get through), but it made a huge impression on me that the Earth's crust was so mobile that it could lift mountains and plateaus out of the sea. It was one of the life-long mysteries (hey, 10 years to a 20-year-old is half a lifetime!) that plunged me into a career as a geologist and teacher. It might seem almost a mundane observation once a geologist has explored the depths of the crust and mantle and the full breadth of geological history, but a first realization is a powerful thing. To those students, geologists, teachers and bloggers who haven't contributed to the Accretionary Wedge before, think about it! 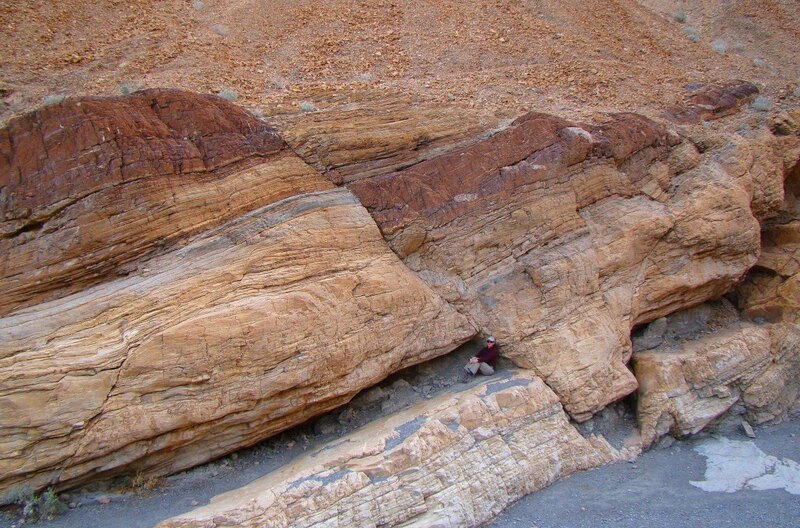 I know I have a few students who blog on geological topics. If you don't blog, but would like to contribute, I would be more than pleased to host your entry as a guest-blogger on Geotripper. Jump in! You may think that the life of a geoblogger is fascinating and exciting, given their tales of derring-do and exotic travels, but the truth in my case is far more mundane. I still have to do the yard work and take out the garbage; "but honey, I had 300 page hits yesterday..." doesn't cut it as an excuse to sit on the couch all day writing stuff. I was encouraged to "get some fresh air" and some "exercise", so I found myself mowing the lawn. This short post is actually about the thought processes that go into writing blog entries. I forget to hook up my MP3 player (by now about MP1.5; it's a little beat up), so nothing was flooding my brain with musical stimuli while I was working. It was just my brain and me, doing menial labor, and more menial labor than I meant to do. It was fascinating to watch my brain at work. First off was the problem-solving that had to take place. It's February, for heaven's sake, so the lawnmower had become buried in the far reaches of the garage, behind the Christmas decorations somewhere. There were some big empty boxes that had to be disposed of, torn up and tossed in the recycle barrel. I got that done, and opened the door to the sideyard and realized that the aluminum can bins were filled to overflowing, and blocking the path. Isn't someone in charge of crushing the cans? Oh yeah, the kids moved out. That's my job now. So there came a half hour of stomping on somewhere around 400 cans. The path was finally cleared, and I got the mower out on the lawn, and twenty minutes later the job was done. And along the way I discovered something of how blog ideas are generated. Three or four of them just popped right out as I worked. What the heck was I doing mowing the lawn in February? The grass was growing, that's why. 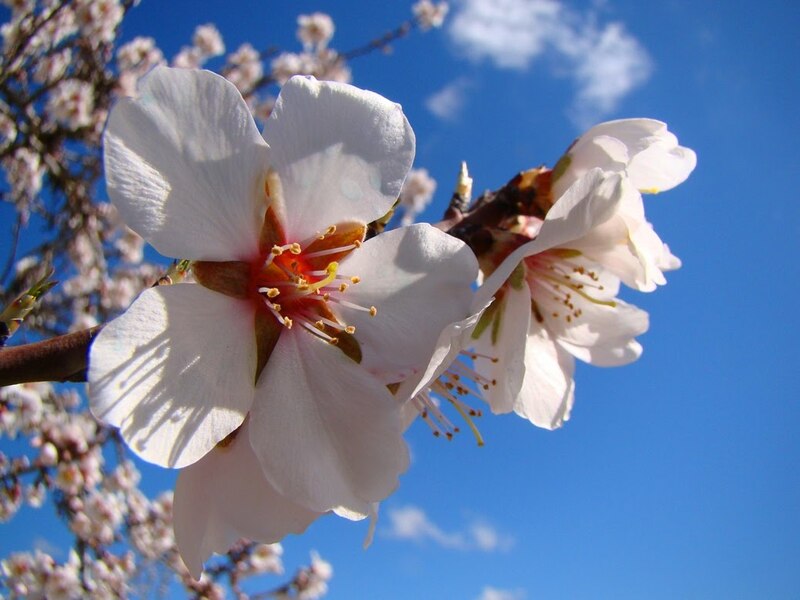 I know it is hard for my friends and readers shivering in the snow across the northern hemisphere to comprehend this, but it has been two weeks or so of sunny weather and temperatures in the 60's and 70's. But still, February is early. I used to be able to wait until the first week of March. So it struck me how early things are happening. Blossoms are starting to appear on some of the trees in the orchards, and (ominously) on the trees in my backyard (that means lots more work this weekend trimming trees). There is a lot of hot air about whether global warming is happening or not, but here is an example on our own doorstep. What am I doing here at home? I should be on the road! 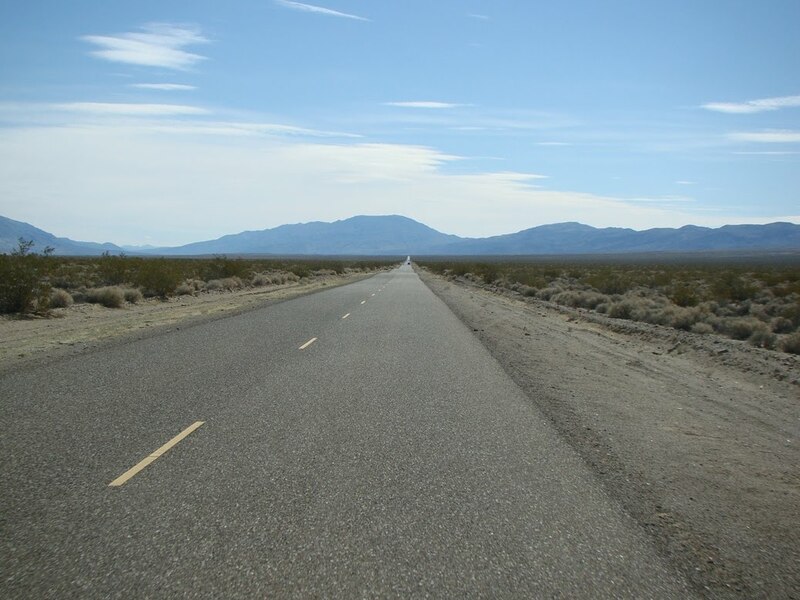 Thankfully this sad situation will change in a few days as I and 25-30 students hit the road later this week on our way to Death Valley National Park and the Mojave Desert. Look for something more to look at on this blog than aluminum cans and mowed lawns. The Other California: What do you do with a used forest? 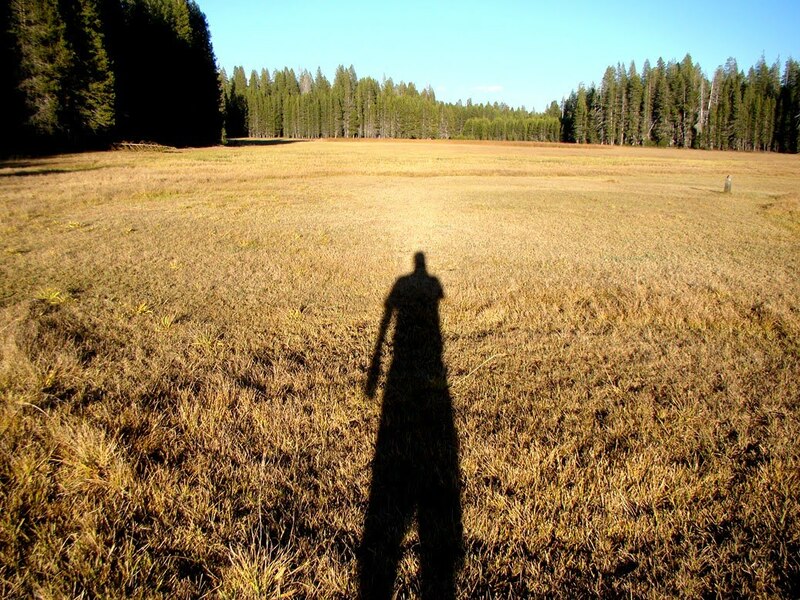 Humans have cast a long shadow over Sierra National Forest (oh, sorry about literal metaphors). There is a huge swath of mountain territory between the south boundary of Yosemite, and the northern reaches of Kings Canyon. This is the drainage of the San Joaquin River, and to most travelers it is terra incognita, a blank spot on the map. 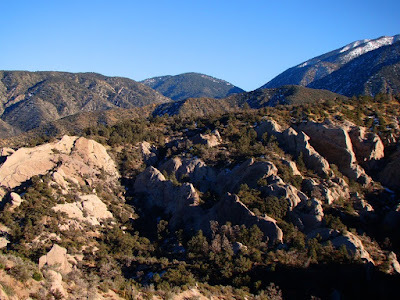 Structurally the Sierra Nevada is a 400-mile-long block of mostly granitic rock that is tilted towards the west, with a long gentle western slope and a very steep eastern flank. Most of the major rivers start at the crest and flow west through deep canyons to the Central Valley. Due to a geological glitch of sorts, the San Joaquin has its headwaters more or less east of what by all rights should be the Sierra Crest. The high rugged ridge of Mts. Ritter and Banner and the jagged Minarets extends south from Yosemite, and reaches elevations exceeding 13,000 feet. 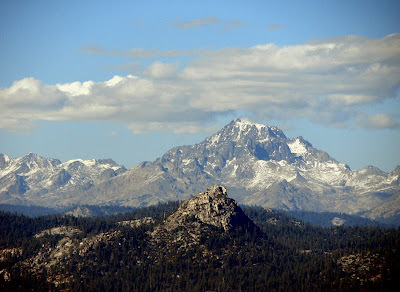 This would seem to be the crest, but the river flows in a deep canyon around the south end of the Minarets, and the actual Sierra Crest off to the east is a somewhat uninteresting ridge of volcanic rock that barely exceeds 10,000 feet in elevation. Mammoth Mountain (that of the ski area) is the high point on that part of the crest, and from the west it doesn't look like much. Even the John Muir Trail skips this part of the crest and winds along the lakes and ridges below Ritter, Banner and the Minarets. The headwaters of the San Joaquin is a spectacular area, and Devils Postpile National Monument draws many visitors. But that's not the region I want to talk about today. 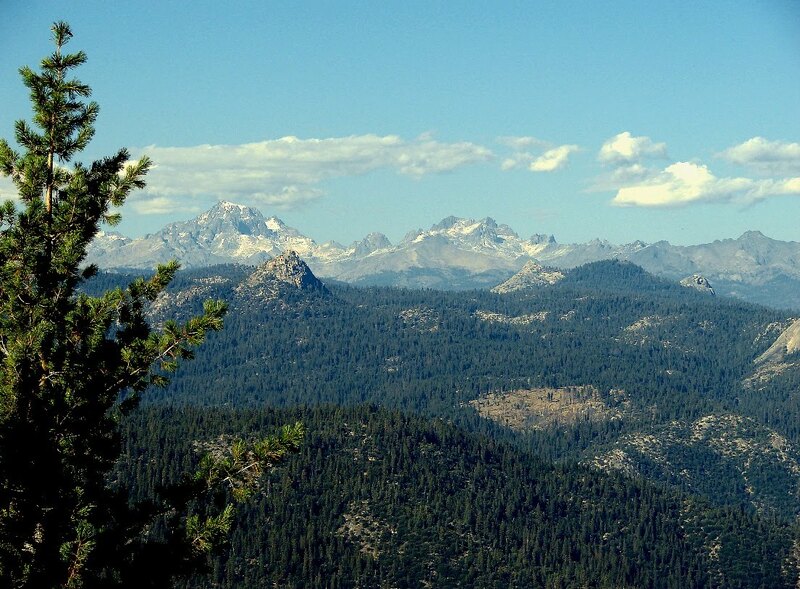 The blank spot I speak of is downstream, west of the Minarets, and between the national parks. 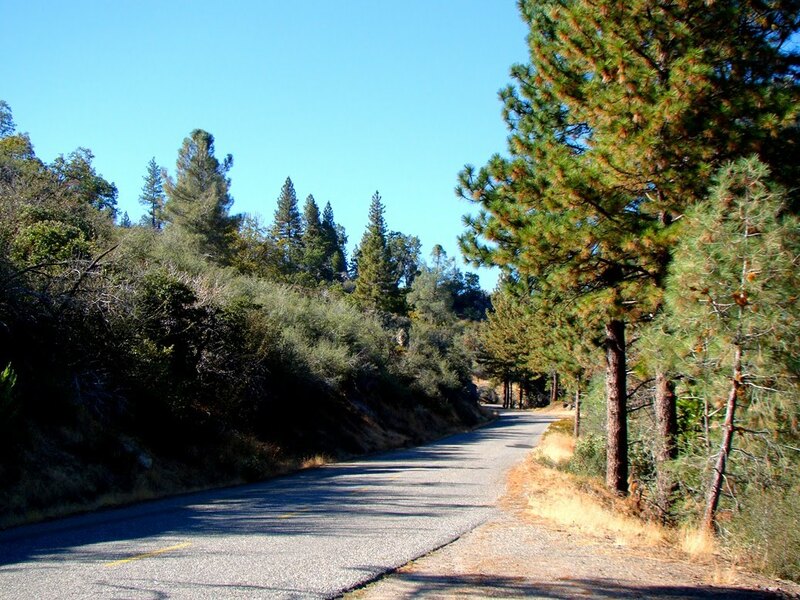 The land is administered by the Department of Agriculture as Sierra National Forest, and there aren't generally a vast number of tourists to be seen there. That's not to say that the land is not known. It is known quite well by some. It is a landscape that has been fully utilized under the doctrine of multiple-use, the operating principle used by the Forest Service to justify any money-making enterprise that anyone can think of. 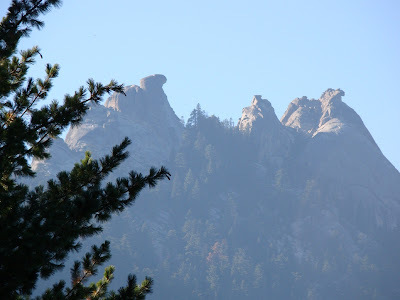 The vast conifer forests have been logged heavily, huge dams have been constructed, herds of cattle graze the meadows, and mining took place, especially in the metamorphic rocks near the Minarets. In land-use terms, this is a used-car lot of a natural environment. So what do you do with a used forest? What do you do when the biggest trees have been cut down, and the mills shut down? 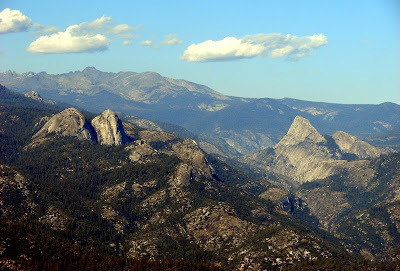 The mines have been abandoned for years even though they were probably the reason the Minarets were left out of Yosemite's boundaries in the first place (although a desire to build another paved trans-Sierra highway might have been another motivation). It starts with the understanding that time is a healer. Trees are growing back, and logging has left a network of roads through the region, some paved, others not, but somebody got creative and linked a series of utility roads into a rather marvelous route that explores some very scenic and interesting country. 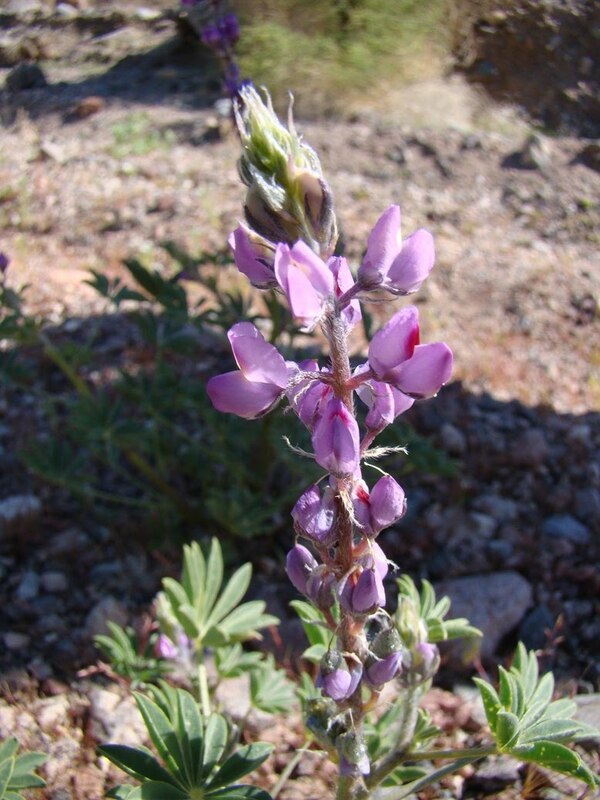 The public relations people labeled it the Sierra Vista Scenic Byway. We explored the road last fall, and I can give it a thumbs-up as a great place to explore. Much of the region is a densely forested plateau pockmarked by green meadows and the occasional granitic dome. The San Juaquin River has carved a deep gorge through the bedrock, which is mostly an intrusion of granitic rock called the Mt. Givens granodiorite. It is one of the largest single intrusions of the Sierra Nevada batholith, with a length of about 50 miles and a width of 10 to 20 miles. 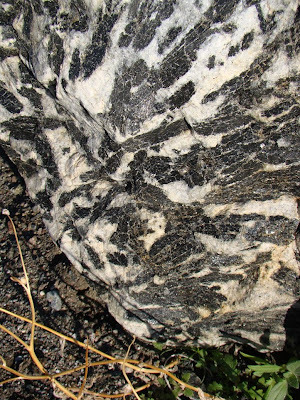 It was emplaced about 90 million years ago (Bateman, P., 1992, Plutonism in the Central Part of the Sierra Nevada Batholith, California; USGS Professional Paper 1483). Glaciers carved the rugged peaks of the Ritter Range, and extended across much of the area betwen the parks. The whole loop is more than 70 miles, and is paved road for the most part. 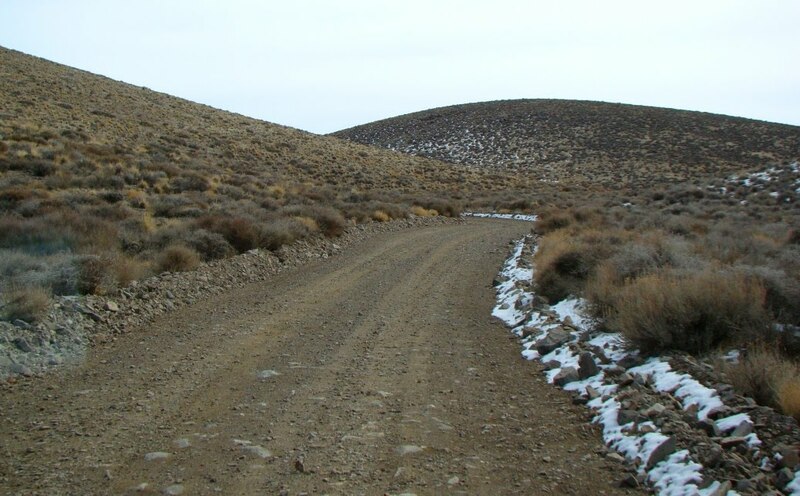 Several sections were once paved, but they sort of gave up trying about 40 years ago, so there are a few bumps here and there, but most cars will have no problems. The road is closed during the winter and spring until the snow melts. The Forest Service has a handy map and guide online here, and America's Byways has a guide here. A number of interpretive displays have been constructed, and there are a few chemical/pit toilets at the picnic stops, but don't look for much in the way of amenities or gas stations. 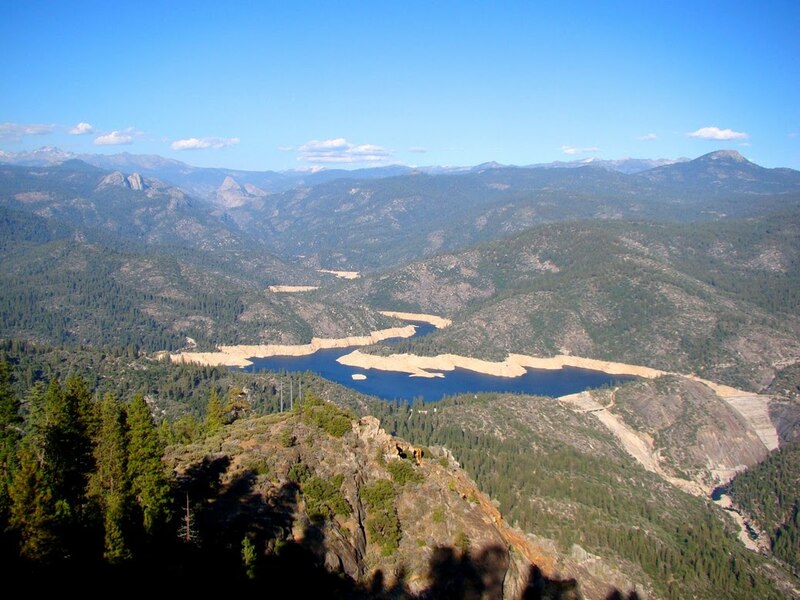 Supplies can be had down the hill at North Fork, Bass Lake, and Oakhurst. 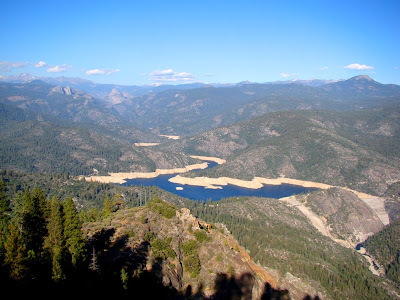 Mammoth Pool Reservoir (above) impounds the waters of the San Joaquin River. A side road provides access. A second side road near the southern end of the loop road visits the geographic center of California. The Eagle Peaks (below) are exfoliating slopes of granitic rock seen at the Mile High Overlook, one of the best view points on the road. The Overlook provides the spectacular views of the Minarets seen in the pictures above as well (photos courtesy of Susan Hayes; first photo is mine, standing in Jackass Meadow, appropriately enough). Globe Rock, a huge balanced boulder, was discussed in a previous post.